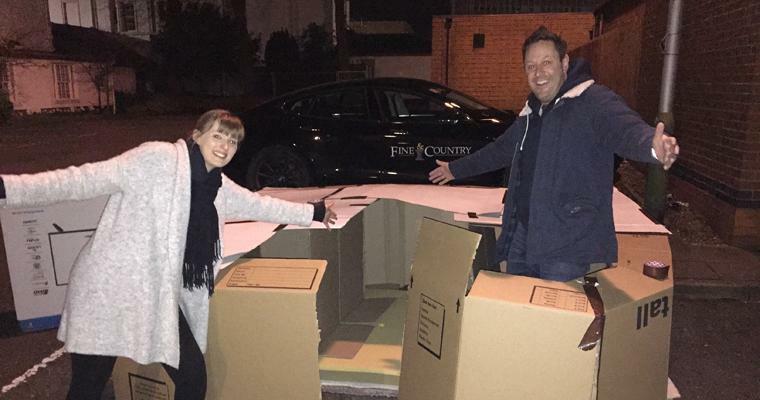 Claire Heritage and Sam Funnell with their cardboard sleeping fort at Hope4 Rugby’s 2017 sleep out. 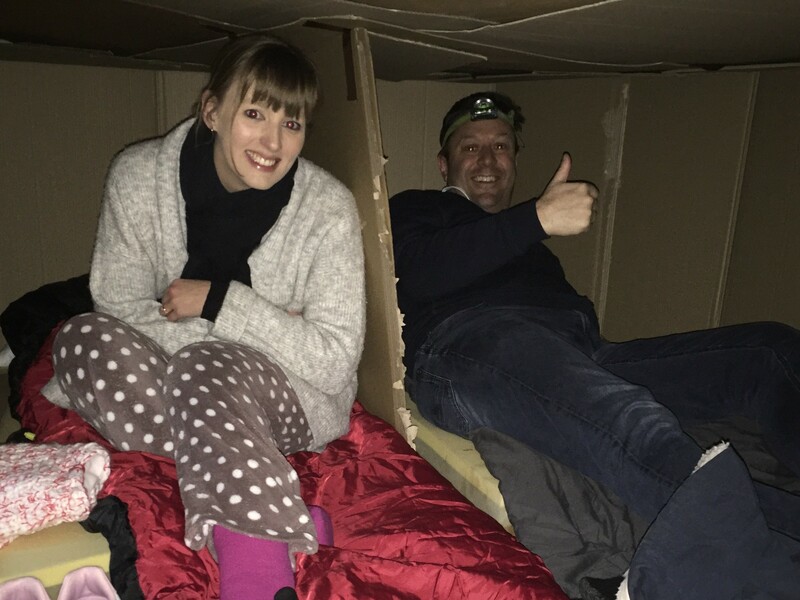 Sam Funnell, Branch Manager from Fine & Country Rugby and Claire Heritage, Marketing Manager from Fine & Country Rugby will take part in their third sleep out in association with The Fine & Country Foundation to support Hope4 Rugby on Friday 1st February. Claire said: “Homelessness is very close to our hearts. We have worked with Hope4 a lot over the years and seen how they have developed, expanded and continued to support our local homeless and vulnerable community. The Hope4 Rugby sleep out takes place in Newbold Road car park, next to the charity’s premises. The sociable event invites volunteers to construct cardboard forts to keep out the cold and make the ground slightly less uncomfortable. Everyone eats together, plays games, competes for the best cardboard and as it approaches 11pm, tucks into their sleeping bags. To support Sam and Claire, please donate here. 1. Wear lots of layers. It’s not the most comfortable, but it helps regulate your body temperature. I have been known for my fleecy pyjama bottoms, not only do I like to feel as if I am actually going to bed, but it’s an extra layer of warmth. It may look silly, but trust me, no one cares about fashion at sleep outs. Claire sporting her fluffy pyjamas at the Hope4 Rugby 2017 sleep out. 2. Make sure your sleeping area is waterproof. If you are dry then at least you can try and keep warm within your sleeping bag. The cardboard competition is a bit of fun, but actually serves a useful purpose. 3. Thick socks, gloves and a woolly hat. The human body loses seven to 10 per cent of heat through your head*. Your extremities, like feet and hands, are quick to follow which can cause a number of health problems if exposed to bitter temperatures for a prolonged period. To help Sam and Claire reach their fundraising target, please click here. *According to the British Medical Journal, 2008.